Comic Con sneak peek: A Klingon trolley service, banners and off-site wonders! Tomorrow the doors for Comic Con open for preview night, but the town is already coming together. Check out a few glimpses of the splendor and spectacle that is Comic Con, as we predict Comic Con's most epic moments. Perhaps the best thing to come out of Comic Con's steady growth in popularity is the entire town's transformation. Con is just too big to for the convention center alone, and 2010 is no exception. We're already getting in a stream of pictures and reports about amazing off-site happenings. Just today Klingons were spotted taking over the San Diego trolley, replacing the Earthling language with Klingon type. 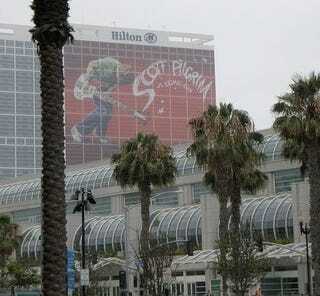 Be on the look out for the Garlic Truck Scott Pilgrim and company are rolling out at SDCC. The Hilton Gaslamp Courtyard is going to be completely consumed by this film and comic. Follow SPvsCC on Twitter to get announcements as to when you can meet the cast and creators, listen to live performances from Dan the Automator and Kid Koala, will spin, and Gorgeous Got a Gun, the winner of Sonicbids' will play! The "experience will start on Thursday at 12 PM. Did you have a blast at last year's Flynn's Arcade? Well guess what — it's back. We don't know if the infamous Flynn's t-shirt will be appearing again, but you can be damn sure I'll be there, and fighting the rest of you off for it. What are we holding our breath for at this Comic Con? An assembly of live-action Avengers on stage in Hall H at the Marvel panel on Saturday! Is this going to happen? No idea. Thor is great and all, but we need to see the entire Avengers roster all on stage, preferably in costume. We will settle for Captain America, Iron Man and Thor, with an Ant-Man casting announcement. Perhaps Hulk and Ant-Man will be announced too? Who can know for sure. As far as Warner Brothers and DC I swear to God, if Neil Patrick Harris isn't the Flash, we'll burn this convention to the ground — or maybe just get excited about who else they chose. As far as big surprises we're really excited to see what the aliens look like in the Steven Spielberg produced Fallen Skies series. We hear they showed footage of the extra terrestrials at the TNT upfront, hopefully they will show the same and more at SDCC. We're also very interested in NBC's The Event, which we're really hoping is as smart as it looks, Nikita, and if we don't see Walking Dead footage soon we may O.D. on excitement. If we had to speculate about comic-centric announcements at this years Comic Con we're gunning hard for Marvelman. Plus a bit of information about the Avengers new shadowy nemesis, cheeks clenched for a cross over. We can't get enough of Bruce Wayne and we hope that DC will reveal their plans for our time traveling hero. IDW has something titled Infestation 2011, which has a panel on 12:00 room 8 on Saturday, which we're incredibly curious about. Plus we can't wait to see what Mike Mignola is doing on Dark Horse's horror panel with Steve Niles at 3:00 on Thursday in room 9.